GM CEO Mary Barra and FCA CEO Sergio Marchionne sit down with President Trump this morning. Ford CEO Mark Fields sat across the table from Trump. WASHINGTON/DETROIT/TORONTO -- Canada isn’t likely to be greatly affected by U.S. President Donald Trump’s demand that the Detroit Three keep — and add — production in the United States, says an economist covering the Canadian auto industry. 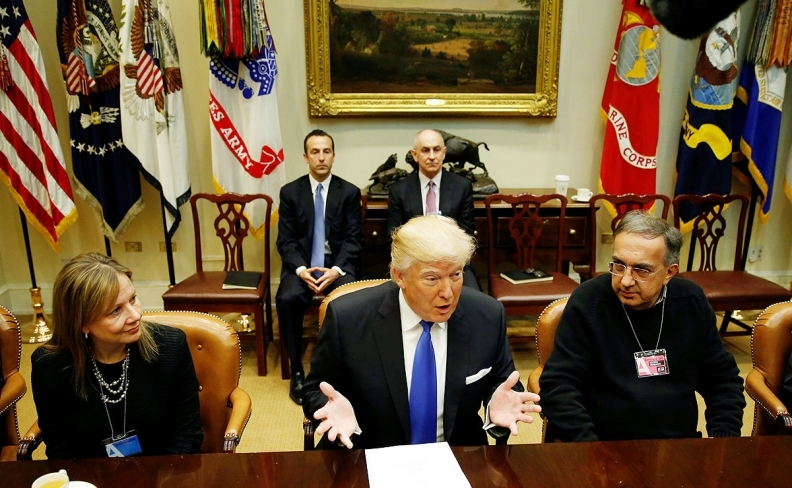 Trump met at the White House Tuesday with the CEOs of the Detroit Three automakers to outline his ideas. ”We have a very big push on to have auto plants and other plants -- many other plants," Trump told reporters at the meeting. "It's happening." Carlos Gomes, a Scotiabank senior economist who covers the transportation sector, said there wasn’t much chance Canada was going to land a new assembly plant from Ford Motor Co., General Motors or Fiat Chrysler Automobiles any time soon anyway. Besides, he said, the Detroit Three recently committed $2 billion to upgrade their manufacturing facilities in Ontario as part of three collective bargaining agreements ratified by union workers last fall. “I wouldn’t say we’re priced out of expansion. We will get additional investment going forward,” Gomes said of the contract promises. Gomes suspects the meeting was as much about Trump calling for spending in the United States as it was about Ford’s Mark Fields, GM’s Mary Barra and FCA’s Sergio Marchionne explaining to Trump how integrated the auto industry is among the United States, Canada and Mexico. “Fine, Trump can tell the industry, ‘We’d like you to do that,’ but part of the job of the industry is to educate him on the importance of how the industry works to the benefits of American workers,” Gomes said. Canadian Minister of Innovation, Science and Economic Development Navdeep Bains told CBC’s Power & Politics host Rosemary Barton on Tuesday afternoon that Canada shouldn’t worry. He said Canada’s strong supply base, automotive research being done at Canadian colleges and universities, and programs like the Automotive Innovation Fund make Canada attractive to U.S. automakers. “The point I’m making is that the automotive sector takes many factors into consideration and that’s why we’ve seen significant investments in Canada,” he told Barton. The heads of Ford Motor Co., Fiat Chrysler Automobiles and General Motors attended the meeting at the White House. The meeting presented Detroit’s automakers with a key opportunity to weigh in on major issues the administration plans to tackle in its earliest days, including trade, regulatory and tax reforms. Trump told the CEOs that environmental regulations are "out of control" and promised he would remove obstacles for manufacturers and oil companies. The president reiterated his desire to reduce regulations, which may indicate a willingness to scale back federal fuel-economy demands. Automakers in recent weeks have urged the Trump administration to rethink aggressive fuel efficiency mandates. Tuesday's gathering was the first time the CEOs of the big three automakers have met jointly with a U.S. president since a 2011 session with Barack Obama to tout a deal to nearly double fuel efficiency standards by 2025. Ford CEO Mark Fields discussed corporate tax reform, the need for “data-driven regulations” and trade policy initiatives that address foreign currency manipulation, Ford spokeswoman Christin Baker said. GM CEO Mary Barra and Chrysler CEO Sergio Marchionne also attended. Marchionne told reporters after the meeting that Trump did not give them specifics on what regulations he would cut. GM, Ford and FCA have all announced recent new jobs and investments in the United States, but are still investing in Mexico. Fields said automakers wanted to work with Trump to create a "renaissance in American manufacturing." "We're very encouraged by the president and the economic policies that he's forwarding," Fields told reporters, praising Trump's decision to withdraw from the Trans-Pacific Partnership agreement, which Fields said did not address intervention in currency valuations by trading partners. "As an industry we're excited about working together with the president," he said. Barra said there was a "huge opportunity" to work together with the government to "improve the environment, improve safety and improve the jobs creation." Trump met Monday with prominent American manufacturers including Fields and Elon Musk, the head of Tesla Motors Inc., and said he would dramatically cut regulations and corporate taxes. But Trump said manufacturers would face tough penalties if they move production outside the country. 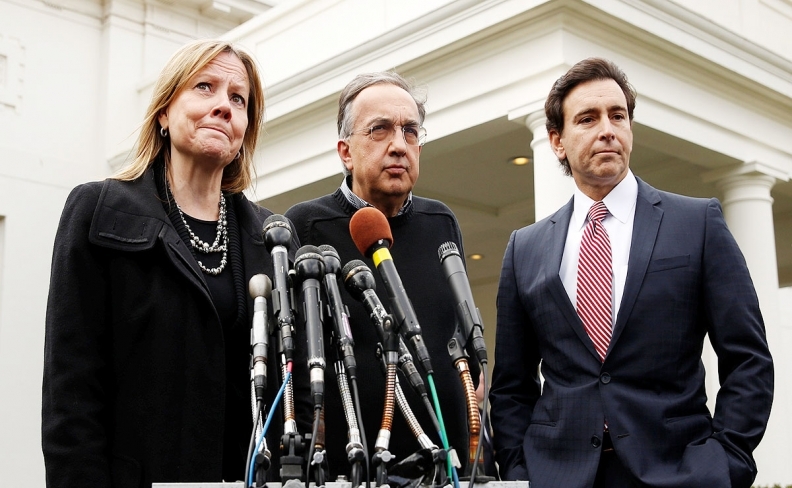 Barra, Marchionne and Fields gave brief remarks to journalists shortly after their meeting with the president. Trump has openly agitated for U.S. automakers to keep jobs in the United States and cancel plans to build plants abroad. Barra, in a statement issued after the meeting, said it was a "very constructive and wide-ranging discussion about how we can work together on policies that support a strong and competitive economy and auto industry, one that supports the environment and safety. "The U.S. is our home market and we are eager to come together to reinvigorate U.S. manufacturing. We all want a vibrant U.S. manufacturing base that is competitive globally and that grows jobs. It's good for our employees, our dealers, our suppliers and our customers." Marchionne, in a statement, said: "I appreciate the President's focus on making the U.S. a great place to do business. We look forward to working with President Trump and members of Congress to strengthen American manufacturing." He said, in total, FCA has committed investments of more than US$9.6 billion in its U.S. manufacturing facilities and created 25,000 new jobs to date since 2009. With flattening U.S. auto sales and some excess capacity, U.S. automakers may be reluctant to agree to open new plants, which likely would not come online for several years. Tuesday's meeting included the former Republican governor of Missouri, Matt Blunt, who heads a U.S. automaker trade association. Vice President Mike Pence, White House chief of staff Reince Priebus and other senior administration officials also attended the meeting. Barclays auto analyst Brian Johnson said in a note Tuesday that he thinks "automakers will be willing to make a deal that would bring back jobs to the U.S. (whether by voluntary commitments or tariffs or border taxes is less clear) in return for a slower ramp of (fuel efficiency) targets and related state-level mandates. While automakers are adding U.S. jobs they are also cutting U.S. small car production. On Monday, GM ended two shifts of production of small cars in Ohio and Michigan, cutting about 2,000 jobs. Automotive News and Greg Layson contributed to this report.